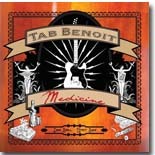 The latest offering from the master of swamp blues, Tab Benoit, is here and it’s called Medicine (Telarc). It’s mostly, but not exclusively, typical Tab Benoit, which isn’t a criticism; it’s what his fans and followers want and expect. The album opens with the title track, “Medicine,” a slow driving blues with some heavy guitar work laid over an insistent drum beat, that sets the scene for another good CD. Track two, “Sunrise,” is a surprise. It slows way down and is very soul based, showing a side of Tab Benoit that doesn’t come to the front very often. It has to be said that he has as good a soul voice as he does a blues voice. Strangely, track three is called “A Whole lot Of Soul,” but it’s pure good swamp blues and it’s a very, very good track. The tempo picks up substantially with “Come and Get It,” a quick-paced rocking blues, and it keeps going with “Broke and Lonely,” which is good Louisiana blues of the type associated with Benoit of old. “Long Lonely Bayou” is a moody, slow, swamp blues with guitar and excellent fiddle. It’s a song about a lost love and is full of atmospheric lyrics and music. Track seven, “In It To Win It," lifts the tempo up to the mid-range, and combines a rocking beat with good swamp music all about a boy growing up in the countryside, and the tempo lifts a little bit more with the next track, “Can’t You See.” The fiddle comes back in on this country blues, and Benoit puts me in mind of early Van Morrison at times on this track. “Nothing Takes The Place Of You” is a country ballad about a man taking his woman’s pictures off of his walls and finding out just how much he misses her – sad and emotive, with Benoit producing a pain wracked voice, a little like Percy Sledge. A medium speed “Next To Me” takes us up to the last track, a nice rocker to finish up the album – “Mudboat Melissa” – with the fiddle player really excelling himself and pushing the guitar work along at a good pace – Benoit at his best! This was an album worth waiting for, and let’s hope it’s not too long before the next Tab Benoit CD.